The most powerful messages are the simplest ones. 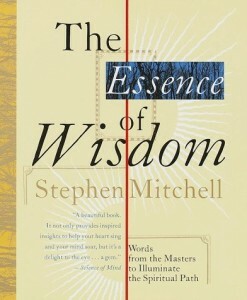 With that in mind, Stephen Mitchell has selected one hundred illuminating sayings from the great Eastern and Western literary and spiritual traditions. Ranging in length from one sentence to a dozen lines, the brief passages in The Essence of Wisdom convey the life-transforming insights of the Buddha, Lao-tzu, Heraclitus, the Zen and Sufi Masters, Spinoza, Blake, Emerson, Rilke, and other sages. The book is arranged to follow the course of the inner life from its beginning to the fullest embodiment of wisdom. Each quotation stands alone on the page. Each is a meditation in itself, meant not only to be read, but to be absorbed and reflected upon. This remarkable book gathers the words of the world’s deepest thinkers and spiritual teachers, and speaks to us in the clear voice of enlightenment. The sayings collected here embody the essence of spiritual wisdom. Each of them, though partial, is complete. Through each part you can see the whole. I have arranged the sayings in a kind of impromptu progression, from the earlier steps along the path to the full embodiment of wisdom. But in spiritual practice, the elementary is often the elemental, and the first step may also turn out to be, at a deeper level, the last step. So although page Y in this book has a higher number than page X, it may not present a more profound or a more refined insight. The progression isn’t necessarily linear. It is meant to be taken lightly. Nevertheless, there is a vast difference in experience between some of the earlier sayings and some of the later ones. Take, for example, the saying I have put at the beginning and the one at the end. “In the struggle between yourself and the world,” Kafka says, “second the world.” Yün-men, when asked what is the essence of wisdom, says, “When spring comes, the grass grows by itself.” Kafka’s is a wonderful saying, with an exquisite sense of timing: it perches the ego out on a limb and then has it, like a cartoon character, saw itself off in mid-air. The Essence of Wisdom is not meant to be read as you would read most books. Each saying stands alone on an otherwise empty page because, in order to resonate deeply, it needs at least that much emptiness around it. (If the economics of publishing were different, each saying would have its own book.) Each is a meditation in itself, enough for a day’s reading; you might try reading one at the beginning of your day, then carrying it with you in your mind, lightly, as the day progresses, and reading it again just before you go to sleep. Even better: rather than reading them, I hope you can find a way to let these sayings read you. Wherever you don’t understand them, and wherever you do understand, let them keep ripening in the empty spaces inside you. The more open you are, the more they will bear fruit. A beautiful book. It not only provides inspired insights to help your heart sing and your mind soar, but it’s a delight to the eye…. A gem.